If you have always wanted to take to the skies in a hot air balloon but have often been put off by the potential cost, then these fantastic vouchers for hot air balloon rides in Portsmouth are perfect for you! Part of the excellent range of leisure offers from Groupon, these vouchers will give you access to great discounts and allow you to make substantial savings on Portsmouth hot air balloon rides. Be sure to tell your family and friends about these special offers and they could well be joining you in enjoying the thrill of experiencing hot air balloon rides in Portsmouth! 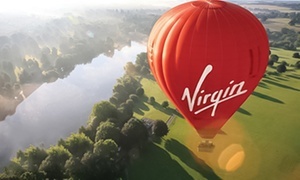 These innovative vouchers for hot air balloon rides in Portsmouth are sure to be in great demand, as the opportunity to save money on experiences like this doesn't come along very often. Make sure you don't miss out on the chance to soar through the air on hot air balloon rides in Portsmouth. Redeem your vouchers as soon as possible and you could soon be flying through the clouds on the experience of a lifetime! If you enjoy your first time as a passenger on hot air balloon rides in Portsmouth and you wish to do it again, then don't despair! Groupon do not set a limit on the number of vouchers that one person can use, so you can take advantage of these great leisure offers on more than one occasion. Redeem your vouchers today!